Aug. 25, 2016 | 3:05 p.m.
Wisconsin's infant mortality rate has held steady over the past few years, in line with and sometimes below the national average. In fact, the rate of infants dying in the state between 2013-15 is slightly lower than it was a decade earlier. 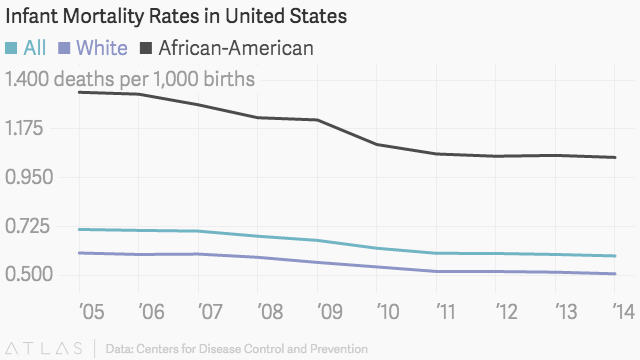 But these numbers, from a Wisconsin Department of Health Services report released in August 2016, show another trend that has persisted over the years: African-American infants die at higher rates than any other racial or ethnic group. This is true nationwide, too, but in Wisconsin the disparity appears to be wider. Demographers and health professionals who spend a lot of time tracking infant mortality rates caution against jumping to conclusions about potential trends or what they mean. Given overall numbers, relatively modest changes in births or deaths can cause changes that appear more dramatic than they are. The DHS report measures the rates in three-year intervals, rather than in terms of individual years, in an effort to compensate for some of the statistical noise. "You see this really erratic up and down [in infant mortality rates], and the truth is that the trend is really somewhere in the middle," said Bill Buckingham, a health demographer with the University of Wisconsin's Applied Population Lab. Stressed that even one infant death is one too many, he said, "The biggest thing to look, at especially when we're talking about minorities, is simply that the numbers are small, and so the rates can be misleading." Health demographers measure the infant mortality rate by calculating the number of deaths per births in a given year among children younger than one year old. 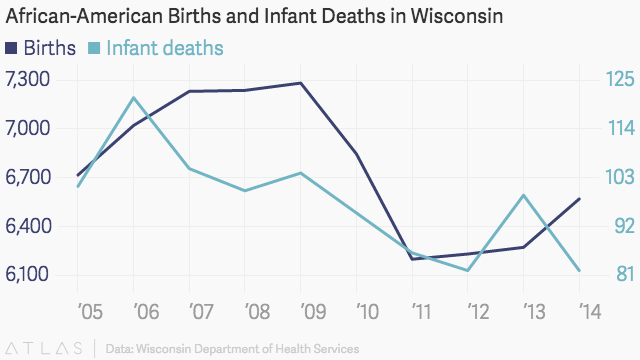 The Wisconsin DHS expresses this rate in terms of infant deaths per 1,000 births, while federal figures from the Centers for Disease Control and Prevention use infant deaths per 100,000 births. All figures are noted here and in accompanying charts as a simple percentage for purposes of comparison. Additionally, the DHS numbers use three-year intervals, while the CDC numbers shown here reflect individual years, and thus may be more affected by short-term variations. Wisconsin's infant mortality rate is based on a relatively small sample size — 384 infants died in the state in 2015, according to DHS. Moreover, the state has proportionally about as half as many African-American residents than the nation as a whole. As of 2014, 6.2 percent of Wisconsinites were African-American, compared to about 12.6 percent across the U.S. residents. This dynamic is likely to be even more distinct among American Indians/Alaska Natives, who have the second-highest infant mortality rate in Wisconsin. But because this group is only .9 percent of Wisconsin's total population (and .8 percent of the nation as a whole), there is an even smaller initial sample size. Small variations in births and/or infant deaths can yield bigger statistical differences at the state level. This issue of sample size helps to explain why a given demographic group's infant mortality rate can show an overall long-term decline, but still have the occasional upward spike. Changes in infant mortality rates can mean different things among different states and populations too. The Bangor Daily News recently looked at Maine's growing infant mortality rate and found infant deaths are rising in that state, but also that births are declining, the combination of which made for a more pronounced trend. This analysis also showed how another state, South Dakota, had both rising births and rising deaths — making perhaps for a lower infant mortality rate on paper, but suggesting a potential problem for infant health outcomes there. The article's author, Jake Emerson, is a data scientist who is working on a PhD at the University of Maine. That northeastern state’s population is far smaller than Wisconsin's (about 1.3 million compared to 5.6 million), so he is keenly aware of how a minor change in births or deaths can look deceptively big, especially within a given subset of an already small population. "There's not necessarily a systematic change in the state, but for whatever reason you can have a few more deaths," Emerson said in an interview. "You've got to be cautious when you're dealing with such small numbers." Given the starting numbers, Emerson warned against reading too much into racial disparities in Wisconsin's infant mortality rates. Deborah Ehrenthal, a physician and public health researcher at the University of Wisconsin School of Medicine and Public Health, agrees, but said the state's trends are still alarming. "I am probably the first one to say, 'hold it, be really cautious when you interpret trends," Ehrenthal said. "What isn't small though, and what you really can't explain by small numbers, is this disparity. A threefold difference in mortality rate isn't small numbers, it's very real." Ehrenthal has researched infant mortality among African Americans in Wisconsin, focusing on especially premature births, which are the leading cause of infant death. She's convinced that poverty and environmental factors place stresses on black women that make it much difficult to experience a health pregnancy and carry a baby to term. "Infant mortality so well reflects the health of a community," she said. Ehrenthal points out that black people who are born outside of the U.S., then move here and have children, have lower infant mortality rates than blacks who grew up in the U.S. "It really isn't race, it's the experience of race here in the U.S.," she said. Ehrenthal takes little comfort in the latest numbers from the DHS. "I think it's really concerning what we see here," she said. 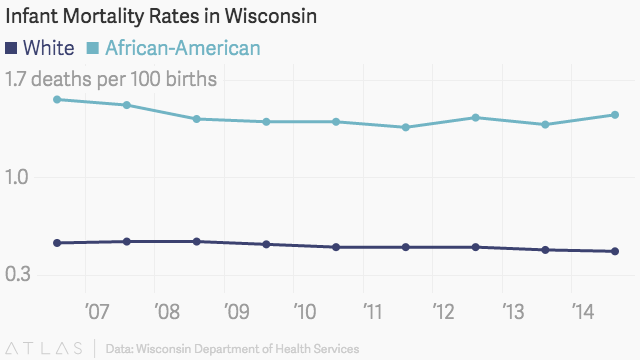 Over the last decade, African-American infant deaths in Wisconsin have decreased slightly — though with some of those erratic year-to-year bumps — as have infant deaths in the state overall. Births are down as well, statewide and among both white and black residents. Still, Buckingham said it's reasonable to surmise that, for African Americans and American Indians/Alaska Natives, the disparity in rates indicates a struggle to hold onto infant health gains and greater vulnerability to short-term mortality spikes. It may be that the infant-mortality picture is improving for all demographic groups, but more quickly and decisively for some than for others. In both Wisconsin and the United States overall, the infant mortality rate has hovered within a couple percentage points of .60 percent over the last five years, following a general but not completely smooth downward trend. In 2013, both rates were at about .59 percent. African-Americans, in fact, were the only racial or ethnic group for whom the rate has been always above 1 percent, both statewide and nationally. These percentages may seem very small, but as of 2010, the U.S. had a higher infant mortality rate than 26 other wealthy nations, according to a 2014 Washington Post analysis. Disparities are also present in other aspects of infant health. The Wisconsin DHS report shows that African-Americans had higher rates of low birth weight and premature births than any other group in 2015. Other analyses indicate more racial/ethnic and geographic disparities: The counties with the lowest rates of first-trimester prenatal care in 2015 included Milwaukee (home to about 70 percent of the state's African-American population) as well as large swaths of rural northern and western Wisconsin. This geographic breadth highlights the distinction between having proximal access to health care and actually using it. "It's funny because if you go on a purely geographical standpoint, Milwaukee has pretty good access to care, but utilization is a totally different kettle of fish," Buckingham said. "Just because the clinic is there doesn't mean that you feel welcome there, that you feel comfortable there, that you can afford to go there." Ehrenthal, while focusing on social and environmental stressors on pregnant women, agreed that gaps in prenatal care has an impact on infant mortality rates. "Health care isn't going to be able to make up for a lot of these other factors, but it has a really important role," she said.